Water boils at 212°F, syrup at 219. 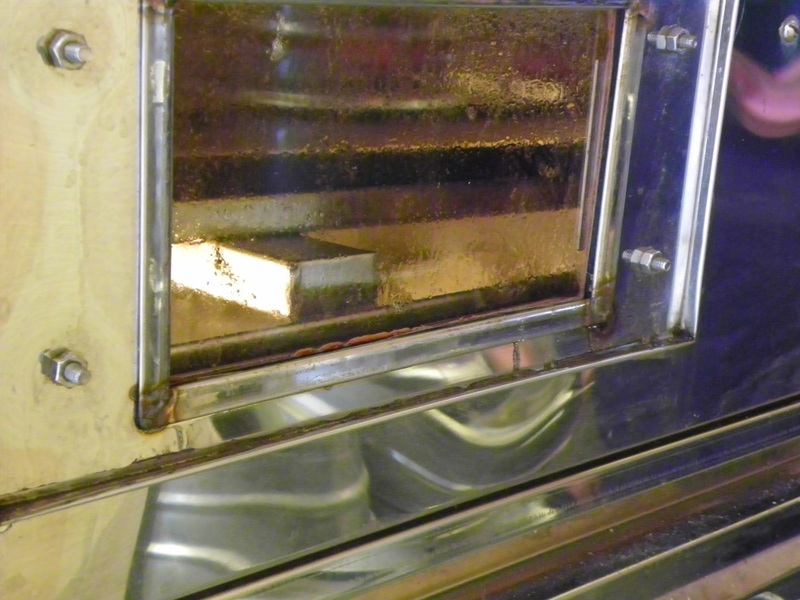 My job this week was to achieve and maintain a constant 219 degrees in the sap pan, using a wood fire for heat. In searching these pages for photos of fire and me, I came across my post The Cremation of MMX and the photo below. I would like to reassure readers (especially Skye and Tina, whose sugar house I have not burned down) that the man in the foreground had no hair to begin with and was fine. The fire in this post was of a completely different nature. Still thin and watery, 500 gallons of “concentrate” sat in the storage tank above the control room in the sugar house on Bobo’s Mountain, the result of a few days of light runs. The collection tank outside was filling fast and would need to be emptied soon so the plan was to boil until there was room enough to turn on the reverse osmosis and continue boiling as the outside tank emptied to get ahead of the run. 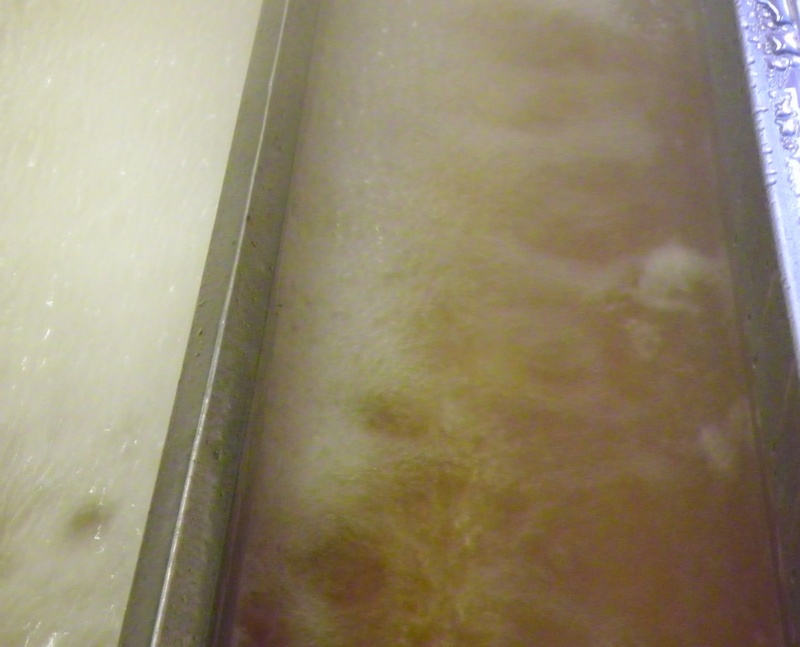 From the storage tank , cold sap flows into the upper pan of the evaporator, where it heats up. 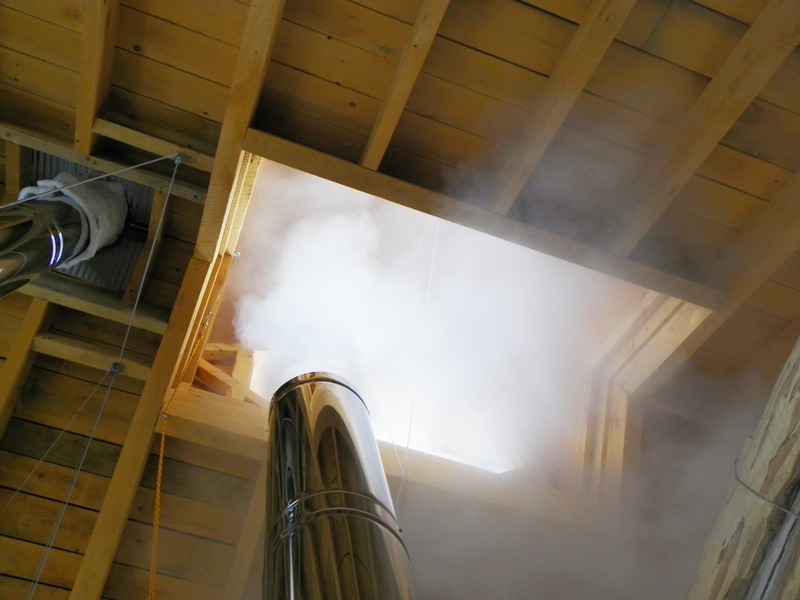 Clouds of steam pass through the forward stack and leave through openings in the cupola, while a stream of outside air condenses the rest into hot distilled water that drains out the back and is used for clean up and washing. 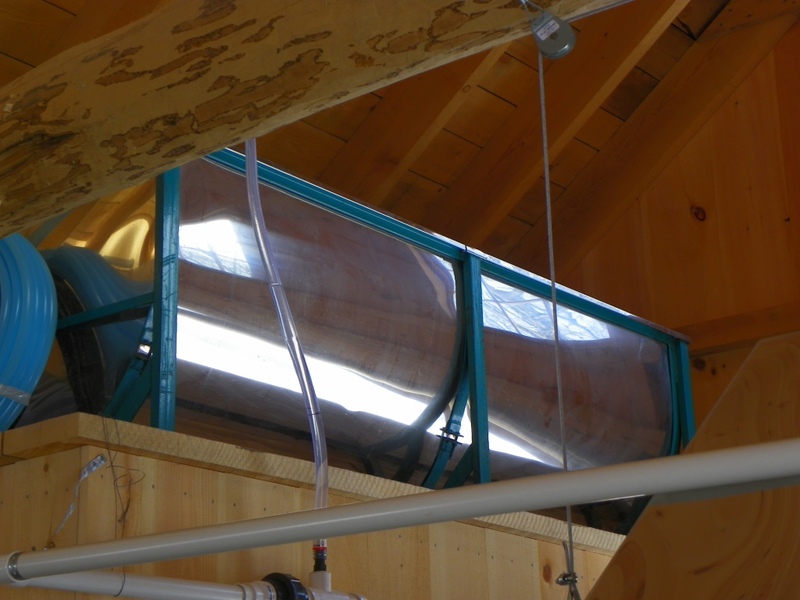 All told, the Steam Away unit can remove up to 150 gallons of water per hour. As the sap loses water it becomes more dense and begins to move through large channels in the pan, eventually dropping into the lower pan, which also has channels, each filled with sap of progressing densities. Some important scientific principle is behind this sorting of densities, involving things like “physics” and “chemistry” but I passed out before it was fully explained to me in equation form, leaving intact my belief that a good part of syrup production also involves “magic”. But my job was not to decipher molecular wonders and fluid dynamics. 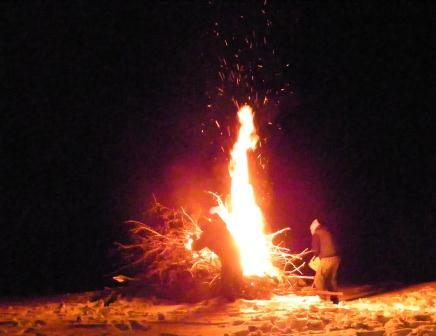 My job was to stoke the fire and maintain the 219 degrees needed for syrup. By the time the sap reached the final channel of the third pan it was much changed from when it had begun its journey hours before. Darker and thicker, it dripped luxuriously when lifted and samples were drawn. With proper temperature and density achieved, a trickle of syrup was released. Checking often allowed the flow to be stopped as soon as unfinished product began to emerge. From early morning (as soon as pipes and lines were thawed from the cold night before) until early evening the fire was stoked. Opening one door and stoking one side at a time kept the draft going so I alternated from left to right, at three to five minute intervals, watching the position of the flames and adjusting accordingly to keep the boil even and avoid hot spots that could ruin both the syrup and the finishing pan. The bottom of the pan turned out to not be the only place hot spots could form and for a very brief while in the late afternoon the left side door glowed, pulsating like an angry cuttlefish. 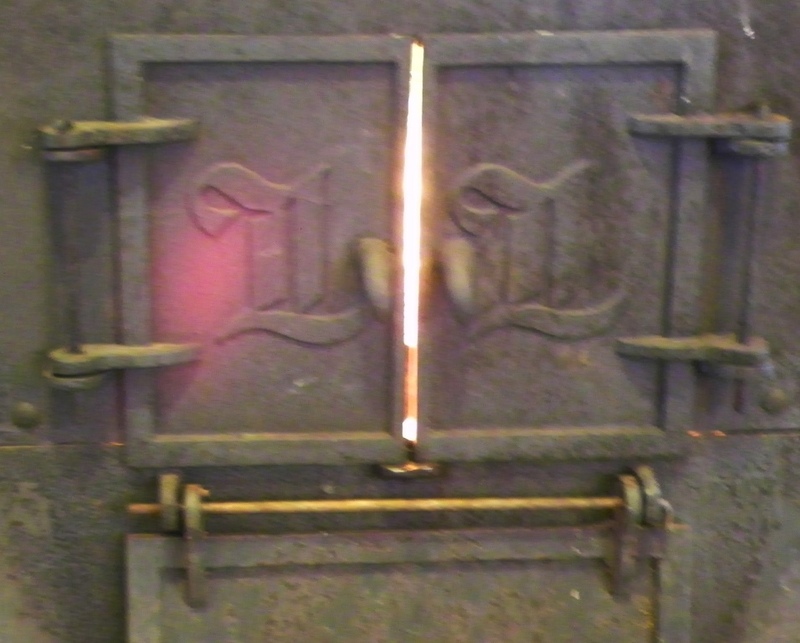 I am not the only person to heat a firebox door to cherry red but it’s not good for the cast iron. Rearranging the fire brought things back under control with no temperature loss in the pan and the boil continued unabated. New sap entered the system as finished syrup found the egress. Each draw brought anywhere from a quart to a couple of gallons of scalding hot sweetness, which was then pumped through a filter press which uses diatomaceous earth to strain out any impurities, usually minerals, also known as “maple sand” or as some folks call it, “the good stuff”. Gritty and dark, most people don’t miss it at all. Those jars up there are what I’m calling the “Stoker’s Draw”. Yes, I will work for syrup. The barrel those jars sit on was filled at the end of the day, 40 gallons of pure dark amber Vermont Maple Syrup put away to be run through the canner and packaged later. The old rule of thumb (also known as the answer to stop the questions) is that it takes 40 gallons of sap to make one gallon of syrup but that assumes certain things, like a relatively high starting sugar content in the sap. This run was relatively low in sugar and took more sap than that. Without the aid of reverse osmosis and the silver monster of a Steam Away who knows how long this boil would have taken; as it was, we boiled for close to seven hours. 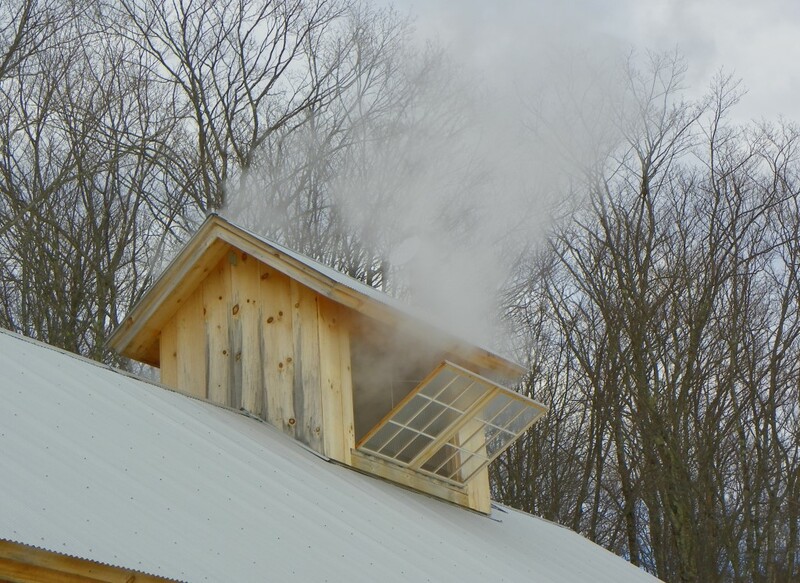 A cold spell this weekend has shut down the sap run for a few days, with heavy flow expected by Tuesday or so. 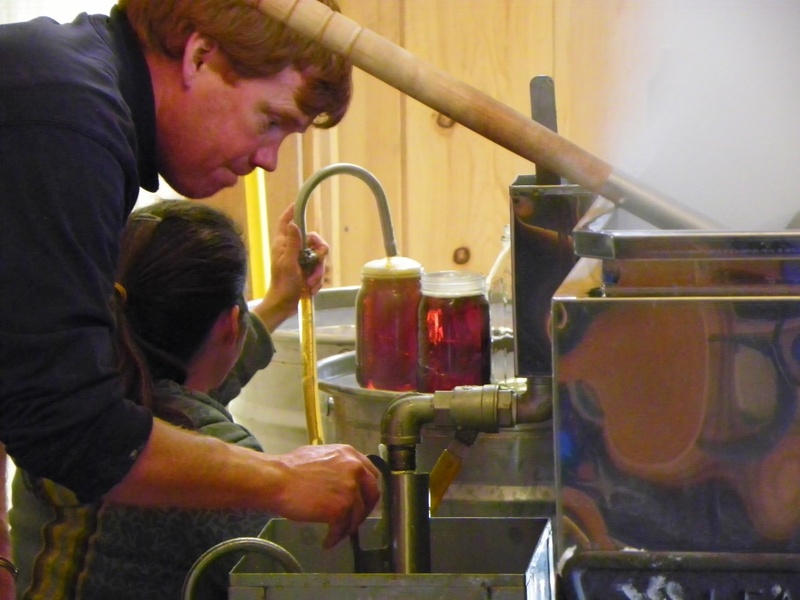 This was a successful first run for Bobo’s Mountain Sugar, making syrup on such a scale, and everyone learned a lot as we went. Three boils have produced more than 100 gallons of syrup so far but this past week was just a warm up for the frantic daily boils to come. 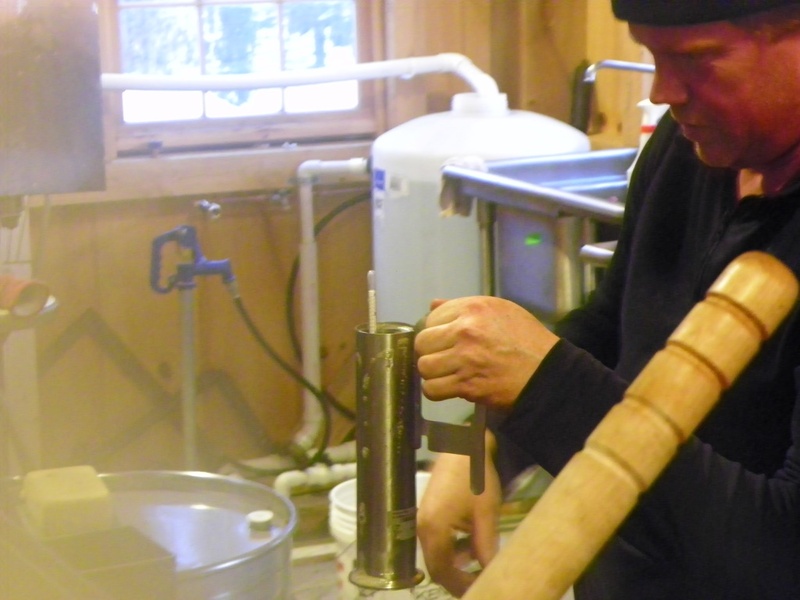 Love the education on maple sugaring, Quill. When I was a wee lad we had a yearly school field trip to Kettletown Sugar Shack. Had a lot of fun watching the boil and learning about the process. After the tour the proprietor would fix all the kids a pancake lunch with fresh maple syrup. All that hard work pays off with some of the best non-alcoholic liquid on planet earth. Having tapped some of the trees and done a few boils, I think this is the best syrup I’ve ever tasted! 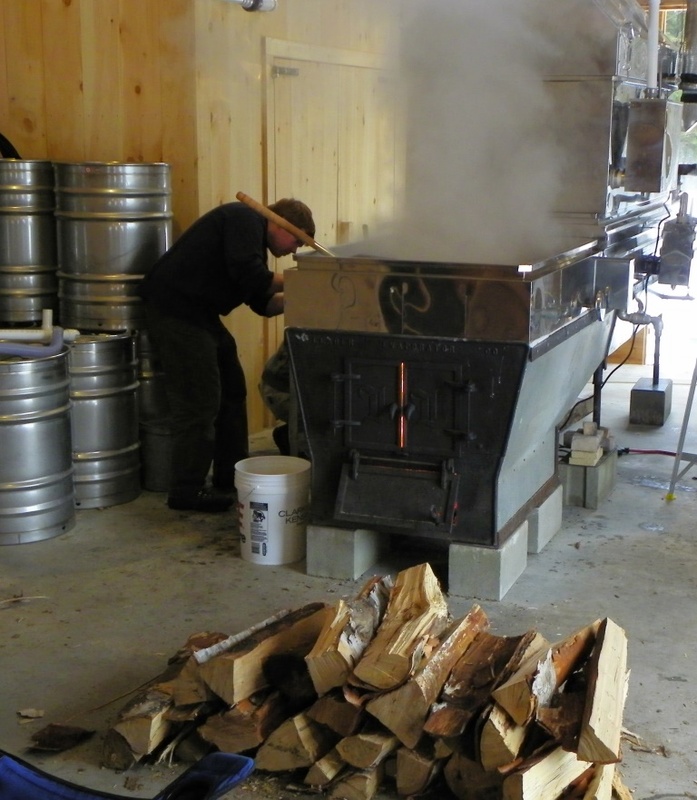 Doing some simple math on the cost of good quality Vermont maple syrup, that’s not a bad way to make a few dollars. Labor intensive I’m sure, but what else are you doing this time of year? I didn’t find anything on their site about cost and shipping or whether they’ll be keeping it all for themselves. I’m assuming the proprietors at Bobo’s never read your older posts, which I guess is good for you. This is a cool process to watch. It’s a big investment to get going on this scale but, over time, it can become a good way to bring in some income during the down time of late winter. Right now the emphasis on Bobo’s Mountain is on getting the syrup made and in barrels. Packaging options are being narrowed down (none include those generic brown plastic jugs) and they will be selling and shipping later this spring. I’ll be sure to let everyone know when they launch that part of the business, probably as part of an fascinating post featuring yours truly pumping hot syrup through a canner and into bottles. It is a cool process! In some ways it’s what I expected, but much more interesting. Plus, I’m getting a nice tan on my face from being in front of the open firebox so much. I’d be interested in knowing when it will be packaged and ready to go. I guess I can go find some in some store somewhere, but then I wouldn’t have followed along on the whole process. Makes it that much cooler to pour on some pancakes some morning. I’ve certainly gotten a new perspective on the maple syrup process. I said a thank you prayer before breakfast this morning…even with my wife’s cardboard pancakes. You should always say thank you when your wife makes you pancakes, even cardboard ones. Just a good reason for more syrup! 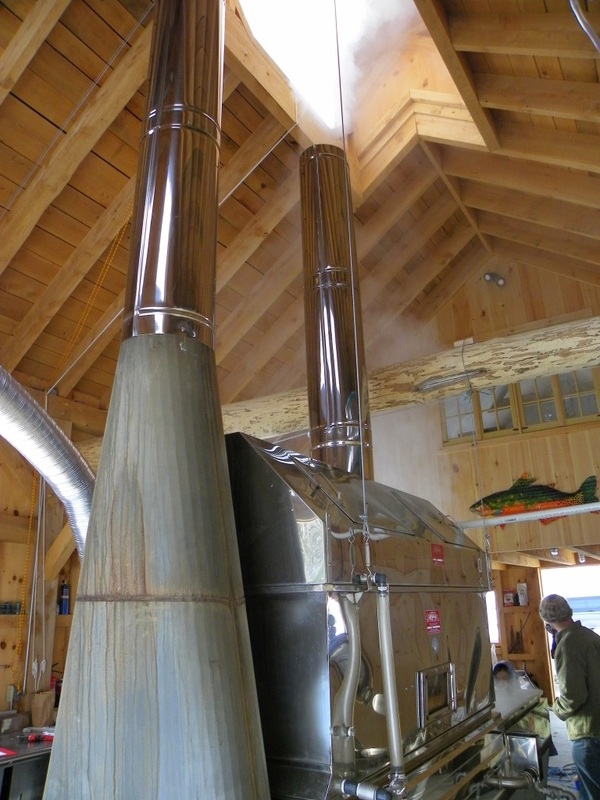 Great post of how the business of maple sugar gets done. … with special packaging and a premium price! I remember when I was about 6 years old a fellow up the street let me borrow some taps and buckets. I tapped the trees (with the old hand-cranked drill) around my house and collected a few gallons of sap. My mother, being the good sport she was, boiled the sap on ths stove for what seemed like an eternity. We ended up with a tiny bit of very tastey syrup. The other unforseen side effect of the boiling was that all the steam peeled the wallpaper above the stove. That was my last adventure in syrup production. I had to chuckle, Luke. My wife has a very similar story of the damage done by “home processing.” Thanks! I’ve lost count of the number of people who have included ruined wallpaper in their stories of home sugaring. Evidently, it takes a few years before everyone involved finds it funny. Sitting here in western Wyoming – eating vanilla ice cream with maple syrup. Glad you are keeping the sap boiling for my ice cream topping! Keep eating, we’re making more! Very nice operation- sap has not dripped here either for the past few days due to a cold snap. Interestingly enough we do have copious amounts of Cabot cheddar readily available. I was a little worried when I first moved here because I refuse to eat that stuff from Wisconsin.